Sapphire Whitening - Chairside Whitening without the sensitivity zing! In our quest to bring you the best in cosmetic and restorative dentistry products, we are "going one step beyond whitening" with the Sapphire Chairside Whitening system. New Sapphire After Care Kit now included featuring Sapphire Home Whitening & Sapphire Brilliance Toothpaste. Having some staining on your teeth is natural. Over time, highly pigmented food will yellow even the cleanest enamel. At Fair Oaks Family Dental, we believe everyone deserves to have a healthy, radiant smile. With professional whitening services from our Pasadena dental team, you can whiten your teeth by up to ten shades. Whether your stains are from smoking, coffee, or tea, professional teeth whitening is a worthwhile and economical solution. A basic understanding of how teeth become stained will help you understand how teeth whitening works. The outer enamel layer of our teeth is porous and can absorb the color from highly pigmented foods. Although avoiding habits like smoking and chewing tobacco can help, normal beverage habits like tea, coffee, or wine can be hard to avoid. Teeth whitening works by pushing out the absorbed dark pigment. Bleaching breaks down these compounds and pushes them out with a powerful solution that can whiten your smile dramatically. Other, more gentle methods also work by polishing the top layer of teeth. We offer both in-office and take-home whitening options. Our in-office whitening treatment can provide visible results in just one visit. 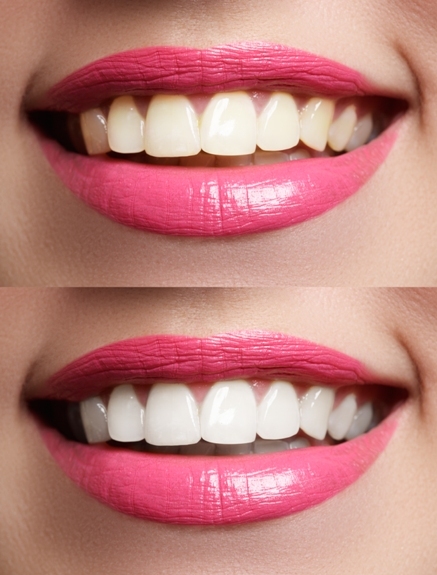 We also offer an optional UV light lamp to speed up the whitening process. Take-home whitening is perfect for gentle, gradual whitening, and you can control the shade and pace of your teeth whitening at your convenience. A bright, white smile looks healthy and youthful. We offer our patients a whiter smile and the confidence boost that comes along with it. Teeth whitening solutions from Fair Oaks Family Dental deliver beautiful results quickly and safely.